Updates to Dunning's profile since your last visit are highlighted in yellow. After the great days prior to May, 1959. I can truly say it has been good. I met a wonderful woman, Frances, while at OU, and finally convinced her to spend the rest of her life with me. We married in Jan, 1965, and have been blessed since. You can see my family on my Harding blog. Carter was born in 1967, has a wonderful wife, Rhonda, and together they have three sons and a daughter. They reside in Katy, Tex. where Carter is the pastor at the local Presbyterian church. Amy arrived in 1970, married Jeff, and they reside in Norman only two miles from us. They have two sons and a daughter. Amy is a homemaker, and Jeff works for the city of Moore, where is assistant superintendant of the Moore schools. By baby-doll, Della was born in 1981, married Chris(krammy)Kramedjian in 2007. They have a brand new baby, Cole. They reside in Norman where Krammy is in graduate school at OU. 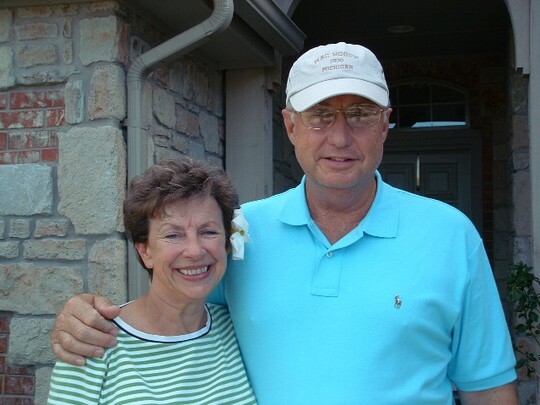 I graduated in 1963 from OU, and began a carreer in the life insurance business until 1990, when I began another career in the home building business in Norman, and stayed there until 2006. I went back in the insurance business then, more from a passionate calling than before. I wanted to have my friends feel certain the plans they made before are still what they want. Frances and I spend the summers in Michigan, where I spent my time in the summers growing up. The entire family spends time there too, and it is really meaningful. The most memoriable time I have were at Harding, and the friends I have from there are the best . I don't know anywhere as great as that school was and the people we got to know. My best friend is Frances, and my family are my best friends. All the people from Harding are up there with them. Thank you all for being my friend. I have given up tennis for golf. It is easier on my body. I want to see every one at the 50 weekend! Have lots of favorite stories, some of my favorites cannot be put to paper. Two of my favorites were with Jerry Richardson while hunting ducks. It took one of our best friends to make it great. That name is Lee, and Jerry can tell you the rest of the story. Dunning Sanger has a birthday today. Dunning Sanger added a comment on Profile. Dunning Sanger has left an In Memory comment for Profile. To my good friend and mentor. We had some good times, and I still have great memories. Tell Ike hi for me, and I will be seeing you again. see you again. Bill Bonnell posted a message on Dunning Sanger's Profile. Dunning Sanger added a comment on Profile. New comment added. Dunning Sanger posted a message. New comment added. we misses seeing everyone at the reunion, but next time. At the present time I am in Michigan with all ten of my grands and the weather is perfect. I wish I could share the time with everyone of you, but will have to do with the grands. Dunning Sanger posted a message. We are having a great time in Michigan, and our thoughts and best wishes are with you. we cannot attend this year, but I gotta tell you guys that you are the greatest group, and I am sorry we will miss all of you. 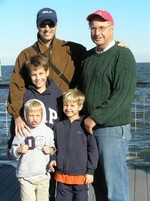 Our whole family, Summer of 2007 in Michigan. 3 kids, 7 grandkids. My son, Carter, and his boys. My youngest daughter, Della, was married in December of 2007. My eighth and newest grandson, Cole, born October of 2008.